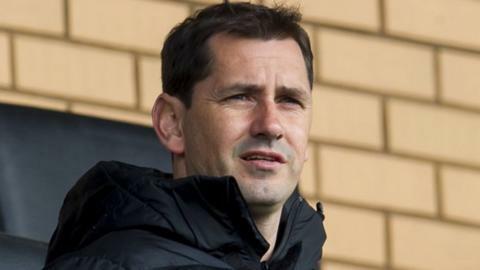 Dundee United have denied Blackpool permission to speak to Tannadice manager Jackie McNamara. United say McNamara, 40, has been aware of the situation and declared he is fully committed to the club. "While flattered at the interest shown, I am very happy at Dundee United," said McNamara. "All of my focus is on the forthcoming Scottish Cup final [against St Johnstone on 17 May] and preparations for the new season ahead." McNamara, who is under contract until 2017, joined Scottish top-flight side Dundee United from Partick Thistle midway through last season. This term he has secured his second straight top-six finish at Tannadice, as well as the Tangerines' upcoming final at Celtic Park. And he insists he wishes "to continue the job and build upon the foundations laid down over the last 18 months or so". "I view the approach as a positive endorsement of all the hard work undertaken by everyone at the club in that period and have no plans to leave," he added. United say they will make no further comment on this matter. McNamara's former Scotland team-mate Barry Ferguson has been caretaker boss at Bloomfield Road since Paul Ince's departure in January. The Seasiders avoided relegation from the Championship by two points.